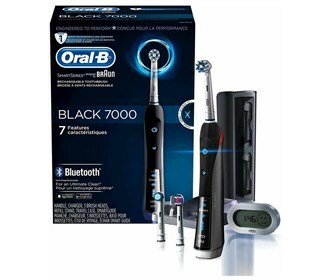 The Oral-B Black 7000 is what happens when German engineers have a zero tolerance for plaque. It accelerates to top speed faster than a high performance sports car. Seven independent functions. Up to 800 brush movements per second. Designed by Braun, it truly is engineered to perform. The first brush of its kind with bluetooth connectivity. 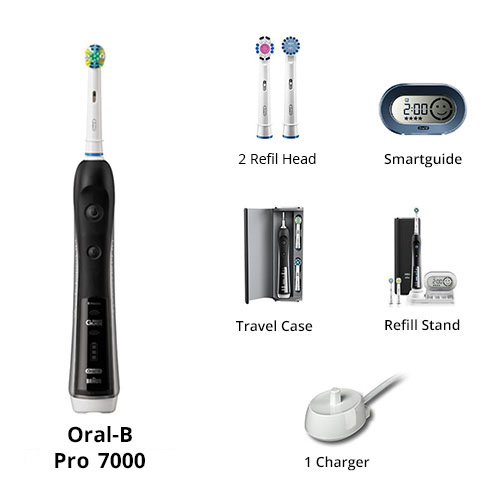 A revolutionary new way to take care of your oral health, the Black 7000 SmartSeries with Bluetooth 4.0 connectivity not only removes more plaque but also eliminates doubt. Simply download the Oral-B app on your smartphone and connect with Bluetooth to get real-time feedback on your brushing habits. It’s the one power brush that actually communicates while it cleans, so you won’t wonder if you’re getting a superior clean— you’ll know. The pressure sensor lights up on your brush and smartphone if you brush too hard. 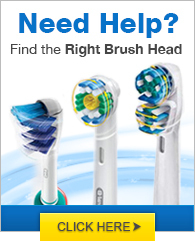 The Oral-B PRO 7000 SmartSeries with Bluetooth features the professionally inspired CrossAction brush head. The round head is specially designed for a tooth-by-tooth clean, and its CrissCross bristles are set at a 16 degree angle to reach deep between teeth to lift and power away up to 100% more plaque.